For those who appreciate strong distinct tastes. Beetroots are great autumn-winter vegetables,undeservedly out of the mainstream cooking.The main variety is dark red but also yellow and white-pink striped beetroots are available in supermarkets or farmers´ markets that carry a wide choice. Beetroot has a sweet taste that goes well with vinegar, garlic or goat´s or other strong cheese. This dish can be enjoyed as a stand alone vegetarian meal or eaten to lamb or pork chops. Since the goat´s cheese and olives add salt to the dish, there may be no need to add any extra salt. The tomato neutralises the strong cheese and compliments the sweet beetroot and the acidity. Cut the onion lengthwise into thin slices. Do the same with garlic. Peel and cut the beetroot into 1 cm thick slices and cut into sticks across the slices. Heat the oil in a pan, fry the onions for a couple of minutes till they turn glassy, add the garlic. Cook for 1 minute. Add the beetroot sticks and cook for 4-5 minutes stirring from time to time. Add a splash of white wine and let it evaporate completely. Now add the vegetable stock (or water) and the vinegar. Simmer at medium-low temperature for 20-30 minutes until the beetroot is almost soft and the liquid has been cooked almost dry. Take the skin off the tomato using the hot water method, take out the seeds and cut the flesh into thin slices and then lengthwise into similar „sticks“ like the beetroot. Cut or slice each olive into 3. 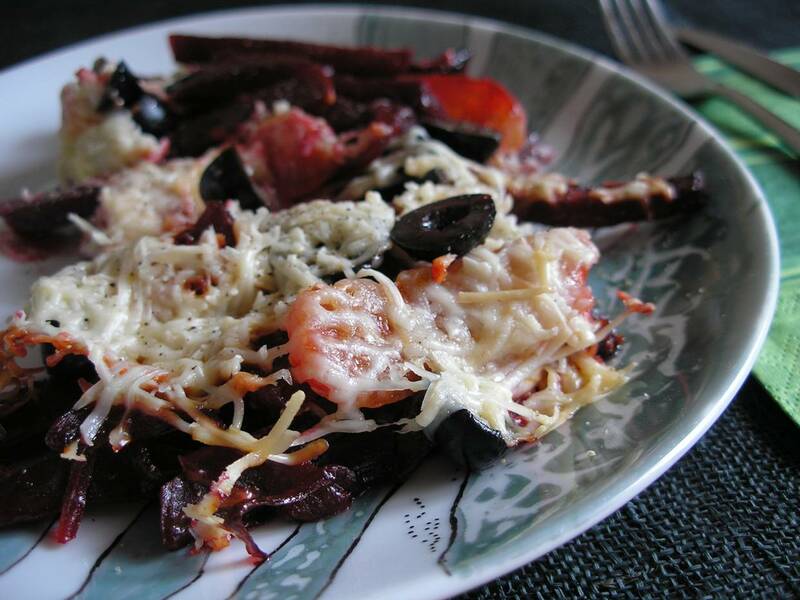 Place the almost soft beetroot into an oven dish, spread the olive and tomato slices and the goat´s cheese on top. Cook in the oven for 20 minutes or until the cheese has melted and takes slightly brownish crust. When serving add fresh black pepper from the mill.